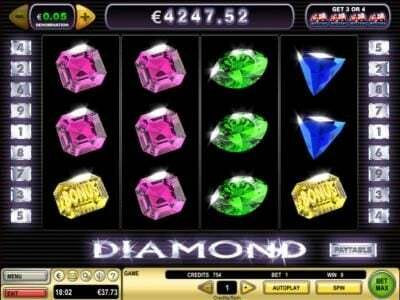 Diamond online slot machine pictures and slot feature list from IGT, play Diamond Slots for free. 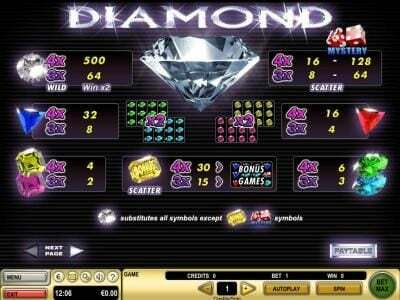 Diamond Slots has not been reviewed yet, be the first to rate this slot. The Diamond is a brand new GTech G2 with 5 reels and 9 paylines. Since this is a modern video Slot, you get to find a massive number of online slot features like: wild and scatter symbols, Free Spins, multipliers and some fixed jackpots that could bring you up to $25,000. The diamonds have always been a very popular theme at the online Video Slots games out there, probably one of the reason why this is happening is tanks to their huge value of these precious stones. The Diamond slot game that is available at the Online Casinos powered by GTech G2 software is definitely one of the best ones available out there. This is an online Casino game that has 5 reels and only 9 pay lines available. The design and layout of the game can be considered to be quite simple and straightforward. You get to see the classic black color in the background, a thing that will help the diamonds stand out. The symbols that you will see on the reels will be mainly made out of diamonds and other jewels. In case you want to forget about clicking the spin button, you can always use the auto-play feature that allows you to choose the bets level and spin the reels automatically. Some players might consider this to take the fun out of the game. 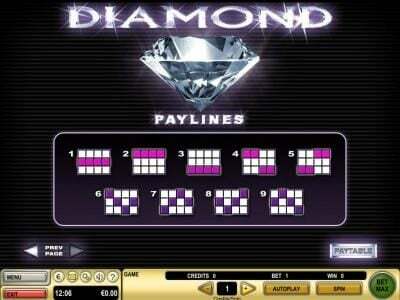 The Diamond is an interesting Slot Machine game where you will get the opportunity to find a massive number of features that can bring you a lot of great prizes. The diamonds symbols are the ones that are definitely the most valuable and in case you get to see one on the reels, you must know that they will act as both a wild and a multiplier at the same time. This means that your winnings will be doubled once you see them and at the same time it will act as a wild symbol, which means that it will change automatically into the symbol that you need in order to have a winning combination. The wild can change in absolutely any other symbol that you need, except for the dice and Bonus. This is happening since these two symbols will trigger a bonus feature. The dice symbol is definitely something that you do want to see on the reels. This is the scatter symbol and it allows you to win an instant prize that can be 8 times and up to 64 times the money wagered and at the same time you can also get a mystery prize. Just make sure you have 3 or 4 scatter symbols on the reels and you will activate a bonus round. This bonus game is very fun and rewarding at the same time. You can only win while playing the bonus round and if you’re lucky enough, you could be dealing with some really great prizes. The game was released back in the year 2010 and it has a lot of fans. You can find it at any Online Casino out there that is powered by GTech G2 software, formerly known as Boss Media. Club World Casino's Queen's Diamond Jubilee Celebration No Restrictions Promotion Today ONLY!